TBD this week sent their intrepid community people through a grand tour of the Metro, charting each and every station’s escalator status. All told, Metro is missing about 13% of their total escalator fleet right now due to mechanical failures of one sort or another, which is both more than it should be, but also somehow less than I thought it would be. In the decade or so that I’ve lived here, this has been Metro’s white whale. They organize high level commissions, or an escalator repair academy, or promise that they’ll get better, and it seems that they never do. It’s rare that I encounter a day where all the escalators along my travels are working. Monday last week, about a third of the escalators I encountered on a red line jaunt (Brookland/CUA – Woodley Park – Farragut North – Gallery Pl. Chinatown), and several made ominous noises that had me wondering if I was about to experience some free-wheeling good times at the bottom of an escalator. It seems that escalators, though, are the least of the problems of an aging system that had several other major crises this week, including a roof cave-in at Farragut North, a train collision with track equipment on the Red Line, and the communications being down yesterday. I’d much rather Metro fix problems like those first, as we can all use a few more stairs in our lives these days. Less than I thought it would be, too. I guess when they’re listing them all, the absolute number seems larger than the percentage of the whole. Way to think outside the box, talktotisha! To this day, I want to know why I can’t go 1 week without seeing several escalators out at Chinatown….2 years….i have yet to go one week…how pathetic is that? 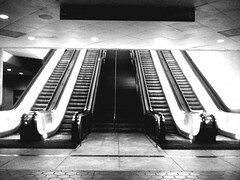 If these escalators are working so bad, why is DC not suing whoever put it in?